New Delhi: Receding glaciers and global warming cannot be conclusively linked, the environment ministry said, despite forecasts that Himalayan glaciers will disappear by 2035 because the planet is heating up. “There is no conclusive scientific evidence to link global warming and Himalayan glaciers, nor to link the black carbon in the atmosphere with the glaciers," environment minister Jairam Ramesh said. “We also cannot link retreating glaciers in the Arctic because of climate change to those in the Himalayas." The minister on Monday released a discussion paper titled Himalayan Glaciers, A state-of-art review of glacial studies, glacial retreat and climate change. “If we see the cumulative average of rate of retreat over the past 100 years, no glacier has deviated from that," said V.K. Raina, former deputy director general of Geological Survey of India and author of the report. “There is no abnormal retreat." 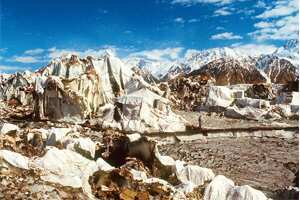 Using the Gangotri glacier as an example, Raina said: “This glacier is 30km long. Even if we assume it retreats at the rate of 30m a year, it will still take 1,000 years to disappear." The Intergovernmental Panel on Climate Change (IPCC), in its fourth assessment report in 2007, said that Himalayan glaciers are retreating faster than in any other part of the world, and if this continues, they are likely to disappear by 2035, or perhaps sooner. The IPCC, which is the leading body for assessing climate change and established by the United Nations Environment Programme and the World Meteorological Organization, attributed the receding and thinning of Himalayan glaciers primarily to global warming. R.K. Pachauri, who heads the IPCC, could not be immediately reached for comment. “There are a number of scientific reports, including in the IPCC, that there is a clear threat," said Vinuta Gopal, climate and energy campaign manager at Greenpeace India. “The time now is not about trying to find conclusive evidence, the time now is for action." Some scientists say research and field data are too limited to conclude a direct link. “There is no field data to corroborate that the glaciers will disappear in the next 20-30 years. The range has 9,000 glaciers and we study about 30. And whichever we have studied, we need more detailed data. If we want to study glacier behaviour, we need to monitor for 8-10 years, but we only manage two years at most," said R.K. Ganjoo, director of the Jammu University’s regional centre on Himalayan glaciology. Shakeel Ahmad Romshoo, associate professor, department of geology and geophysics at the University of Kashmir, said that although very few glaciers have been studied and data is inadequate, it is evident that global warming affects glaciers. “Out of those that have been studied, in Himachal (Pradesh), Uttarakhand and Jammu and Kashmir, there is no doubt that they are retreating and it is due to increase in temperature," Romshoo said. “But we don’t have enough data to establish by how much." Raina said that studying the mass balance of glaciers is more critical and indicative of their health than their retreat. The environment ministry will collaborate with the Indian Space Research Organisation to undertake a three-year study to map glaciers through satellites. “The effect of black carbon on Himalayan glaciers, which is a highly contested viewpoint, will also be studied," Ramesh said.